Like Being With People Who Like Fishing? The Seacoast Anglers Association meets on the third Monday of every month at 6:30 PM at the VFW Post 10804, RT 57 & RT 9, Little River, SC. 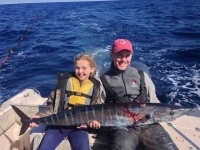 March 19th Meeting GUEST SPEAKER- Captain Keith Logan, North Myrtle Beach Fishing Charters. Subject: Where To Find The Fish! Refreshments and food at the bar. The public is welcome to attend. Come early – bring a friend! If you are not the lead dog, then the view is always the same!